Clutter can make a space look and feel disorganized, confusing, and stressful. Clutter can also make it difficult to keep your home clean and it tends to snowball as piles of paperwork and other ongoing projects are moved from room to room to make space for, well, more clutter. Reducing clutter is a way for your home and life to feel cleaner, better organized, and more manageable. Image courtesy of Home Wizards. 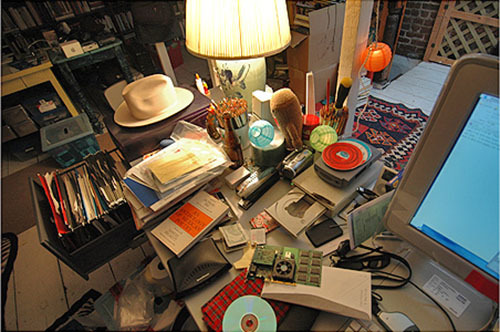 Desktop clutter is one of the most common causes of chaos in the home. Many homeowners are looking for ways to reduce or eliminate household clutter. The solution to the problem depends on the source of the clutter. Clutter is usually created when things are scattered around without a place to go. 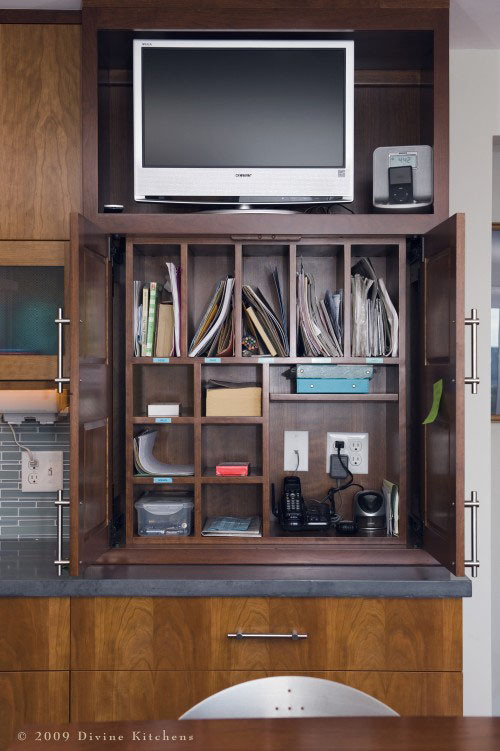 A home remodel is the perfect opportunity to integrate custom space-saving organizational solutions. Image courtesy of Real Simple. 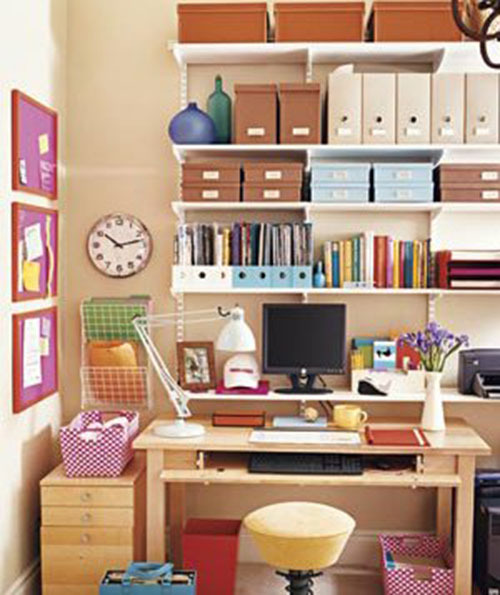 An organized home office often requires plenty of shelving and a foolproof filing system. Clutter is also created by the stuff we use to decorate our homes. Knickknacks and personal trinkets used to be a way to integrate personal style into a home’s decor, but current interior design trends have moved some of our most precious stuff into the realm of kitsch. A third source of clutter comes from the items we love but never use. Many of these items are toys or gadgets that lost their appeal over time, while others are memorabilia and family heirlooms that can be very difficult to let go of. A home remodel can be an opportunity to create clean, uncluttered rooms by saying goodbye to items along with the spaces they used to occupy. Removing clutter has become a main goal of many home remodeling projects, and there are a number of ways that you can integrate organization and clutter cutting right into your home’s new design. Take a look at our list of ideas for preventing and reducing clutter in the home. Some tips can be used in your current space, while others can be integrated into a remodel or become the focus of a home improvement project. If you have any clutter-busting success stories of your own, don’t forget to share them in the comments section at the bottom. Determine the clutter’s point of origin. Identifying the source of the problem will help you formulate a solution. If your problem is piles of paperwork, your solution may be a filing system. If your problem is knotted mazes of charging devices and cords, you may need a device charging console. Say goodbye to unused items and things you “might” use. You might use the ice cream maker that never came out of the box or the rock tumbler you bought and used once after a trip to the beach. But if you haven’t even thought of them in several years, you probably won’t use them again. A good rule of thumb is to get rid of anything you haven’t used in over a year, especially if you forgot you even had it. Create a place for essentials. Everyone needs a place to set their keys, wallet, and phone when they walk in the door. Whether it’s a front entry table, cubby holes, or shelving next to the door, a place for essentials will keep you prepared to leave the home each time you need to. Image courtesy of Northlight Architects. The bench, cubbies, and cabinets just inside this kitchen door provide a place to leave essentials for the night. Each time you bring home a new item, get rid of a similar older one. For example, if you buy a new broom or mop, get rid of the old one instead of throwing it in the garage. Cycling through items reduces clutter created by items you no longer use. Junk mail and catalogs don’t just clutter up our homes, they also use up resources and create unnecessary waste. Retail websites have the same items as the catalogs and more, making catalogs obsolete. For the next six months, vow to call and remove yourself from the mailing list each time you receive a piece of mail you don’t need or want. More than half the items we take with us each time we leave the home don’t need to come past the front door. Shoes, coats, hats, sports gear, purses, shopping bags, and much more all need a place to live, but it doesn’t have to be your living room floor. Coat closets don’t hold much and have become a thing of the past. A mudroom stops the mess and contains it before it enters the home. Buy items with multiple functions. A blender that doubles as a food processor takes up less space than two separate appliances, for example. You don’t need to go out and replace every gadget in your home to create room, but the next time you need an updated item, see if you can make a single purchase that allows you to get rid of two older items instead of one. Keep lists in a notebook or phone. Lists help us stay organized, but not when your lists keep piling up until they resemble clutter. The beauty of modern devices is that they contain everything we need in one place. If you like making paper lists, try keeping them all in one notebook. For a family-sized solution, try adding a white or blackboard to your kitchen. Many remodels and new construction projects are integrating smart storage that’s build right into the wall, much like the cabinets you would normally find in a kitchen. Multiple compartments with doors to hide the contents keep homes looking clean and uncluttered. The full wall of cabinets added during this San Francisco home remodel by Dijeau Poage Construction, provides plenty of storage space for the miscellaneous household items that can create clutter. Don’t buy things you’ll only use once. Many items commonly purchased by homeowners can be rented or borrowed if they are only needed temporarily. Items used for household projects take up a lot of room in garages and sheds and aren’t utilized very frequently. If your DIY home project is a one-time shot, consider using your neighbor’s equipment or the local rental shop instead of buying. Practice quality over quantity when it comes to birthdays and holidays. And this goes for any occasion where you’ll be receiving gifts. Try providing family members and friends with a list of items you really need, using a registry, or asking people to pool their money toward one big gift. Leaving people to their own devices when it comes to gift giving can often lead to owning a lot of unneeded items that become clutter. We all have memorabilia in our lives that reminds us of good times gone by, but the older you get the more the collection grows and it can begin to become a burden. Create a designated place for personal treasures and try to limit them to one box, tote, or trunk of a reasonable size for your home. Scan old photos and paperwork. Boxes of old photographs, important paperwork, and other archives from your life can be scanned, stored digitally, and backed up on an external hard drive. Old photos may actually get more views in a digital album and they can easily be shared with others who may not get to see them otherwise. The same can be done with old awards, certificates, and children’s artwork. Get rid of old movies and music. If you have an instant movie streaming account, you can probably watch any movie you also happen to own on DVD or VHS. An iPod or similar device allows you to digitize your entire music collection. Selling off or donating your movies, music, and the machines it takes to play them can cut clutter like no other. 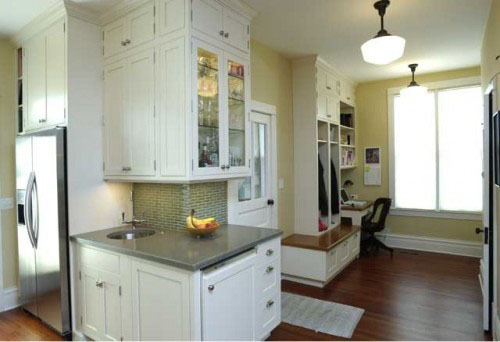 Traditional cabinets can make a space feel cramped or look cluttered. Recessed cabinets are set back into the wall to give spaces a more open feeling. 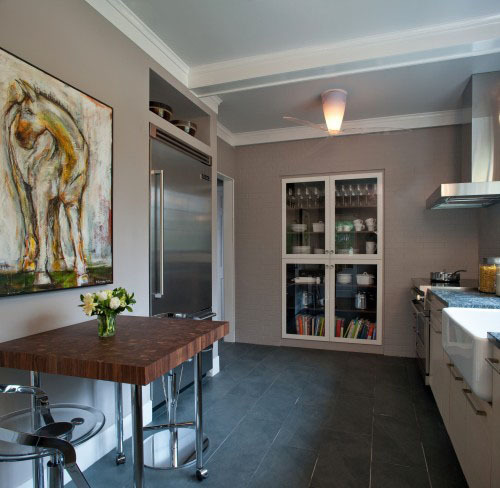 The recessed cabinets in this kitchen by Aidan Design keep the walkway clear and the room clutter-free. The glass fronts allow for easy contents scanning without opening. Organize the garage like another room in the home. Perhaps your home is only organized because you’re using your garage as a dump. The same storage solutions you use inside your home can be integrated into the garage as well: cabinets, shelving, cubbies, totes, and hooks will leave your garage with room to spare. Organizing your garage will help tame the clutter in both the garage and the inside of your home, and you may even be able to park the car in there next winter as a side benefit. Use vertical storage and design solutions. Especially if you have a small living space, you will need to create storage the goes up instead of out. Vertical storage takes up less floor space and can help make a home feel less cluttered to boot. Image courtesy of Mercedes Corbell Design. An entire home office fits inside a converted closet with the help of some vertical shelving and lots of organizers. Say goodbye to dust collectors. Certain items collect more dust than others. Multiple smaller items on display in the home can be tedious to keep clean and are easily damaged. They also create a cluttered or busy look in a room. If you can’t bear to part with these treasures, consider purchasing a display case to help contain and preserve them. T-shirts, water bottles, and other swag that we bring home from events we participate in really adds up over the years. Before you know it you might have a whole dresser dedicated to t-shirts or an entire kitchen shelf just for free plastic water bottles. Keep a few favorites, donate the rest, and start refusing items at events so you don’t bring them home in the first place. If you have a lot of stuff to get rid of it can really pay to have a yard sale. You can make a few bucks to help pay for your home’s new look and it may actually be easier than hauling multiple carloads to your favorite used-goods donation center. Pump up your closets and cabinets. Most closets and cabinets come with basic shelving inside, but you can customize the insides of these spaces to further organize your life and create a compartment for everything. Custom shelving helps keep the insides and outsides of your closets clutter free. This kitchen entertainment center by Divine Kitchens contains the mess and organizes it too, including a device charging console that tames the mess created by electronics. Using too many items to decorate a room can create visual clutter. Current interior design trends lean toward a minimalist approach to decorating that’s perfect for cutting clutter. Keep only your favorite items and say goodbye to the rest, or start over completely and only add a few decorative pieces to each room or space. Furniture helps with reducing clutter when it gives you a place to hold or organize your stuff. A trunk that doubles as a coffee table, a bench with a seat that opens to reveal storage, and a bed with built-in drawers underneath are all examples. A desk with lots of drawers and compartments may be better than a simple work table. 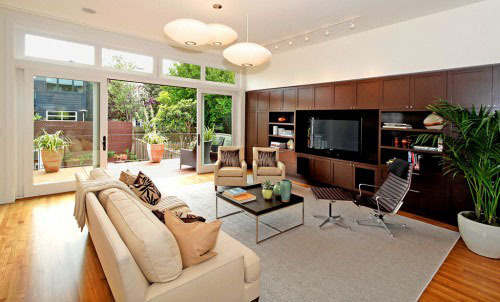 As mentioned before, always try to make purchases that will serve double duty in your home. 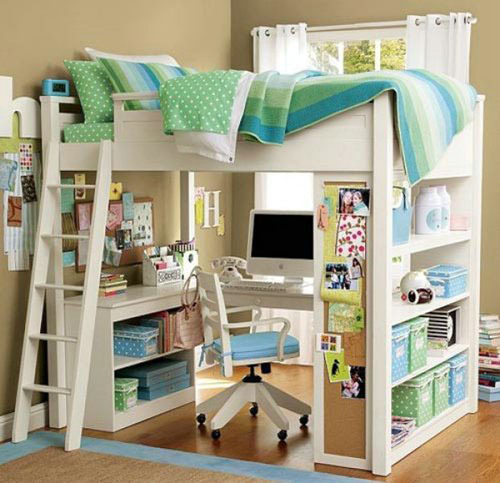 An elevated bed creates a desk nook with plenty of shelves for storage and filing. Whether it’s spring and fall cleaning, a monthly trip to the donation center, or an annual yard sale, make sure you get rid of things regularly. Preventing build-up is a key component of fighting clutter. Keep an ongoing donation box. If you don’t want to hold an annual yard sale and you don’t like throwing items in good condition into the trash, try keeping a donation box in your garage at all times where family members can drop off things they want to get rid of. Most families have room for this solution and don’t find it too inconvenient to drop the contents at a donation center each time the box is full. Having a means to dispose of unwanted items encourages people to practice regular purging.